"Uzma is here also because of co-operations of Pakistan's foreign and home ministries. I thank lawyer Shahnawaz Noon who fought her case like a father," said Sushma Swaraj. In her early 20s, Uzma talked about the torture, harassment and domestic violence meted out to her by her husband Tahir Ali, even as she accused him of forcing her into marrying him in Pakistan on May 3. “They have tortured me in many ways, threatened to kidnap my daughter. So I agreed to marry him to save my daughter. He used to beat me up. Because of my daughter I signed it, they scared me so much that I signed,” said Uzma at the joint press conference in the presence of Sushma Swaraj. She said ‘Buner’, the area where Tahir, the Pakistani man who married her at gunpoint, took her after giving her sleeping pills, was like a “Taliban-controlled” region. Uzma said had she stayed there for a few more days she would have been dead. She broke down several times while recalling the horror in front of the national media. Meanwhile, Sushma Swaraj sought to give credit to Pakistan’s foreign and home ministry along with lawyer Shahnawaz Noon, who she said fought her case ‘like a father’. She said despite tensions between the two countries, the Pakistan foreign office and the home ministry played a key role in her return. “Uzma is here also because of co-operations of Pakistan’s foreign and home ministries. I thank lawyer Shahnawaz Noon who fought her case like a father,” said Swaraj. Uzma is here also because of cooperation of Pakistan’s foreign and home ministries. I thank lawyer Shahnawaz Noon who fought her case like a father: Sushma Swaraj. Earlier today, accompanied by Indian mission officials, Uzma crossed the Wagah border near Amritsar. 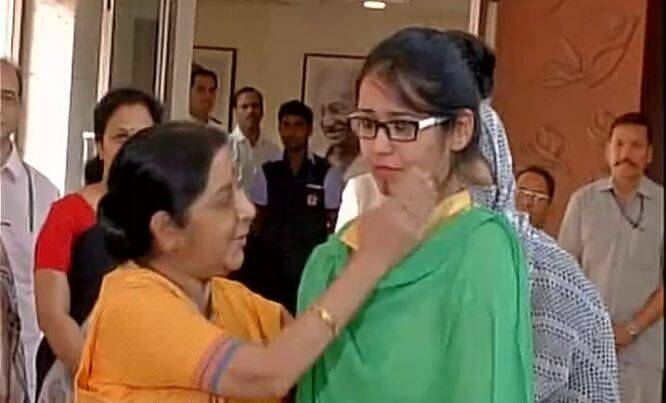 “I heaved a sigh of relief as soon as she crossed the Wagah border,” Swaraj told reporters here. On May 12, she had petitioned the Islamabad High Court requesting it to allow her to return to India urgently as her daughter from her first marriage in India suffered from thalassemia.